Wednesday May 13th 1891 We had a big forenoon work with sweeping the house nearly all over. I was out where they were working on the hen house most of the afternoon. Tishie Woolf was here and Agnes was gone home. The boys got the chicken house about done. Will and I went out to see Fanny on the evening. She is moved down stairs. 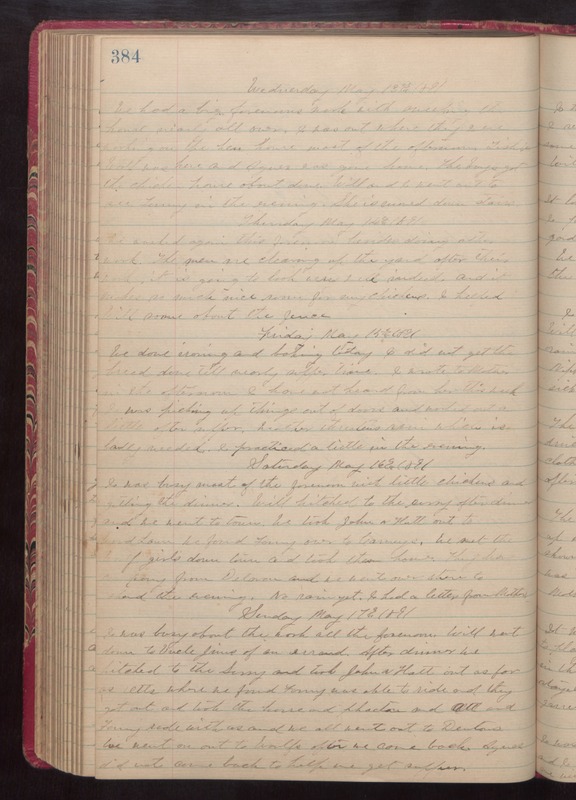 Thursday May 14th 1891 We washed again this forenoon besides doing other work.The men are cleaning up the yard after their work. It is going to look very well indeed. And it makes so much nice room for my chickens. I helped Will some about the place. Friday May 15th 1891 We done ironing and baking today. I did not get the bread done till nearly supper time. I wrote to Mother in the afternoon. I have not heard from her this week. I was picking up things out of doors and worked out a little after supper. weather threatens rain which is badly needed. I practiced a little in the evening. Saturday May 16th 1891 I was busy most of the forenoon with little chickens and getting the dinner. Will hitched to the surry after dinner and we went to town. We took John & Hattie out to Wood Lawn. We found Fanny over to Carneys. We met the Woolf girls down town and took them home. They have a pony from Delavan and we went over there to spend the evening. No rain yet. I had a letter from Mother. Sunday May 17th 1891 I was busy about the work all the forenoon. Will went down to Uncle Jims of an errand. After dinner we hitched to the surry and took John & Hatt out as far as Otts where we found Fanny was able to ride and they got out and took the horse and phaeton and Ott and Fanny rode with us and all went out to Dentons. We went on out to Woolfs after we came back. Agnes did not come back to help me get supper.